The Doll Sweet Journal. : Cold Water and Riptides and Seals, Oh My! A few days after we arrived at the Cape last summer we went out to Nauset Beach in Orleans, which is on the Cape Cod National Seashore (which is federally protected land that can't be built on). There are many beaches that are a lot closer to our house but the National Seashore beaches are particularly beautiful and worth the longer drive it takes to get to them. 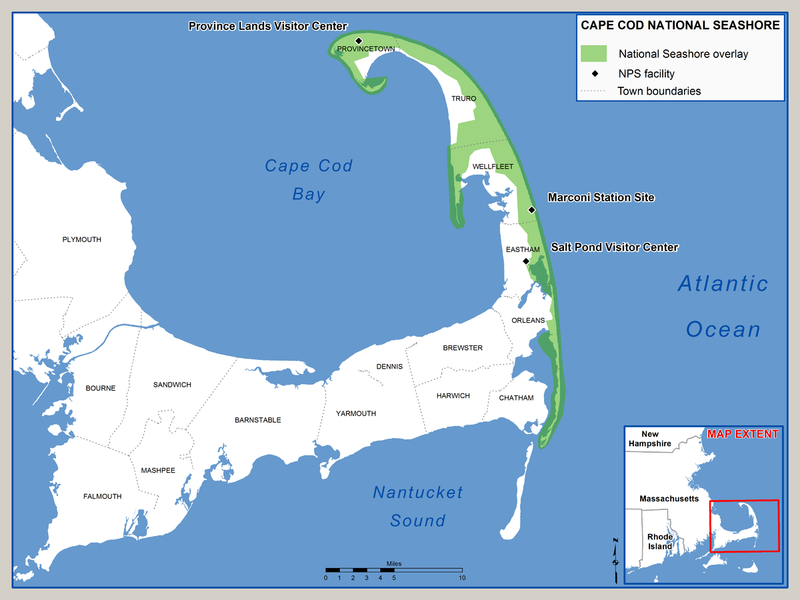 The green is the National Seashore, mostly facing out toward Europe. Nauset Beach is popular and it was our first time going to it. The water was pretty chilly that day, especially before lunch, and there was a riptide warning on part of the beach, so the boys didn't go in the water a lot but they had fun playing on the beach and trying not to get touched by the incoming waves (this is one of their favorite games to play). The beach was pretty crowded that day but you wouldn't know it from the pictures! I don't know what it is about the water on the eastern Atlantic Ocean-facing side of the Cape but it has a gorgeous color to it that I love. For the first time in all my years of beach-going on the Cape, I saw a seal! It was swimming underwater through a wave and looked like it was waving at everyone the way it flapped its cute little flippers. It was an amazing thing to see. Much better than a shark, that's for sure! I put this picture on the back of last year's Christmas card. I love it! It's good to go to a National Seashore beach at least once every summer. I like Coast Guard Beach a little better because it has really pretty dunes that are so picturesque, but this one was really nice too. You really can't go wrong with any of them!